The rural surroundings of Westergeest are the place where the farmers make their living. 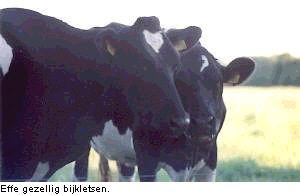 Most of the farms are dairy-farms and the frisian black and white cattle is well known throughout the world. Peace and quietness, that's a good description of the area. As already mentioned, is Westergeest close to the Lauwersmeer (Lauwers lake). It came into existents when an arm of the Waddensea was closed of from the sea in 1969. 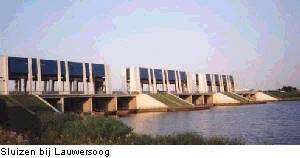 The area is often named Lauwersland, to promote tourism. At the eastside of the lake is an nature reserve and recreational areas. Other things found in "Lauwersland" are "terp"-villages, large farms and a lot of free space. Further to the north is the Waddenzee (Wadden-sea). One can take the ferry from Lauwersoog to the island Schiermonnikoog. By merit of its location Westergeest is a good starting point for a canoeing trip. Paddling through the flat country one can really enjoy the peace and quietness. It's fun to paddle straight trough the centre of Kollum or on the canals of Dokkum. Dokkum is a cozy town about 10 kilometers to the north west. In the city the old rampart's are still intact. Shopping is also a pleasurable pastime here. Some museums are found in Veenklooster, and also a forest called Veenkloosterbos. Veenklooster is popular amongst youth because of the "Ringo-bar". The town-hall of Kollumerland is in Kollum. This village functions as the shopping centre of the area. By digging a new canal around Kollum this village has increased its popularity among pleasure crafts.